An artist's illustration of the European Space Agency's CryoSat 2 satellite, which dodged a piece of space junk on July 9, 2018. The European Space Agency nudged one of its satellites from its normal orbit this week to avoid a potential collision with space junk, with the satellite soaring almost 400 feet (122 meters) above the risky object. But now, the agency needs to move the satellite back on track. The operation comes less than a week after the agency released a new report about the huge amount of debris in space. That report found a total of almost 20,000 pieces of space junk in orbit as of the end of 2017 — more than 8,000 lbs. (3,628 kilograms) of dead spacecraft and their remnants. That was enough to keep CryoSat 2 safe — but now the satellite's drivers need to get it back onto its normal orbital path. That maneuver is scheduled for Thursday (July 12). According to ESA, this week's detour is the second of the year for CryoSat 2, which has made 14 similar maneuvers in its eight-year lifetime. In a directive signed last month, President Donald Trump ordered his administration to prioritize tackling the challenges of space debris. Because space junk and satellites are flying around Earth at a speed of more than 17,000 mph (27,358 km/h), according to NASA, even small collisions can be hugely destructive. Large pieces of space junk can break down into smaller pieces that are more difficult to track, and active satellites can be damaged by an impact. 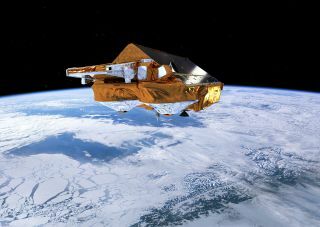 Assuming Thursday's second maneuver goes smoothly, CryoSat 2 will be back to work measuring glaciers and sea level around the globe soon.